“A Quiet Place” (2018). 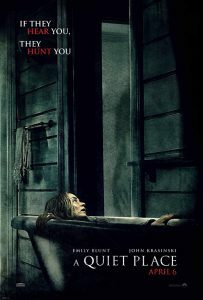 Cast: Emily Blunt, John Krasinski, Millicent Simmonds, Noah Jupe, Cade Woodward, Leon Russom. Director: John Krasinski. Screenplay: Bryan Woods, Scott Beck and John Krasinski. Story: Bryan Woods and Scott Beck. Web site. Trailer. With the arrival of a race of vicious predators, the Earth has become, as the film’s title observes, a very quiet place. That’s because the beastly creatures hunt based on sound, with the slightest noise capturing their attention. Indeed, anything louder than a whisper could suddenly place your life in serious jeopardy. Those wishing to stay alive have had to learn how to keep mum to avoid the prospect of an utterly devastating end. Those are the conditions under which the Abbott family must now function in order to survive. The farm family struggles to keep quiet, something that proves more difficult than one might initially realize. As humans, we take our actions and their associated sounds for granted. It thus truly becomes challenging to lead lives where we must constantly look for ways to suppress the noise. But, then, that’s essential given what’s at stake. 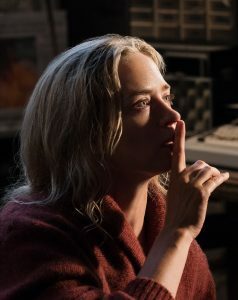 Evelyn Abbott (Emily Blunt), a caring wife and mother, constantly reminds her family to keep mum to stay alive in the chilling new horror film, “A Quiet Place.” Photo courtesy of Paramount Pictures. The film follows the lives of the family patriarch, Lee (John Krasinski), and his wife, Evelyn (Emily Blunt), in their efforts to protect their children, Regan (Millicent Simmonds), Marcus (Noah Jupe) and Beau (Cade Woodward). No matter how diligent they are, however, tragedy looms at every turn, something that inevitably can’t be avoided. The same is true for its potentially devastating consequences. Nevertheless, these circumstances force the family to get creative in their self-preservation efforts. Through rather perilous trial and error, the Abbotts come to learn when it’s safe to vocalize their thoughts and when to look for other means of conveying them. Ironically, one “advantage” they have is their knowledge of American Sign Language, the means by which they learned to communicate with Regan, who was deaf before the predators’ arrival. ASL thus becomes the primary means by which the family members communicate with one another, too, something that proves a godsend under such extremely trying conditions. Still, even with such creative means at the family’s disposal, situations arise that cause trouble. Incidents as simple as the shattering of glass, for example, cause panic to set in, prompting hyper-vigilance to evade the predators and stay alive. And, as the Abbotts’ story plays out, seemingly everyday events that naturally produce sound – and that we take for granted – suddenly become matters of life and death. One can only imagine how things will unfold when a pregnant Evelyn is ready to give birth. 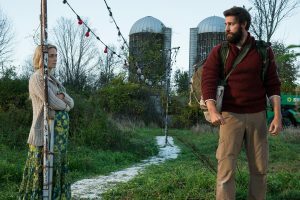 Husband and wife Lee and Evelyn Abbott (John Krasinski, right, Emily Blunt, left) struggle to keep their family alive under unusual and trying circumstances in the gripping new sci-fi release, “A Quiet Place.” Photo courtesy of Paramount Pictures. Given the nature of this story, which principally focuses on taking viewers on a tour of this new and very different world, the narrative is somewhat episodic in scope, but, in this case, that works because of the common elements that link different segments to one another. Also, because of the small ensemble involved here, the film doesn’t cast an especially wide net with its characters, but, again, that works well to keep the story from becoming cluttered or unfocused. With that said, though, the picture is by no means simplistic or monodimensional. 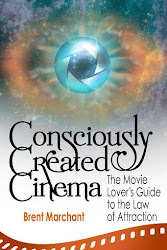 Themes like overcoming fears, surviving the dark night of the soul and thinking creatively to solve personal dilemmas are effectively addressed with treatments reminiscent of those found in movies like “Signs” (2002). What’s more, the picture’s richly layered narrative is deftly punctuated with spiritual symbolism that carries deeper meanings, a quality rarely, if ever, seen in releases in this genre. 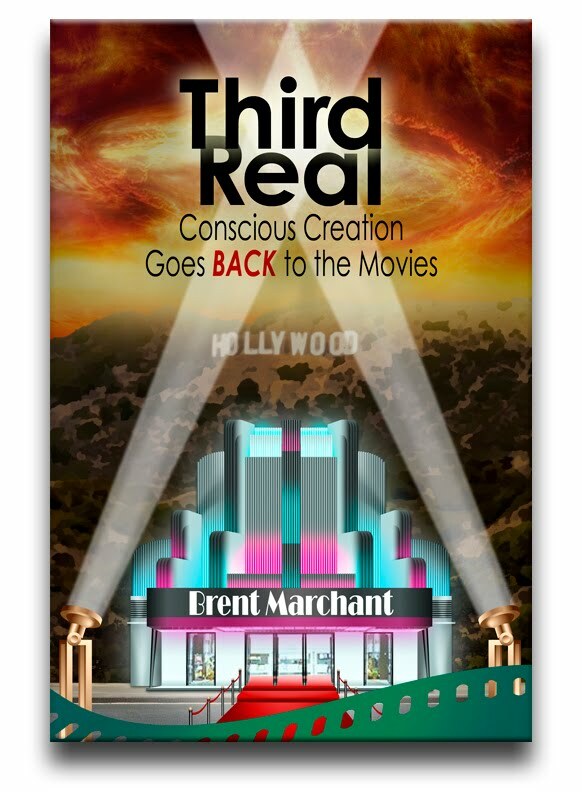 This includes the principles of conscious creation, the philosophy that maintains we manifest the reality we experience through the power of our thoughts, beliefs and intents. 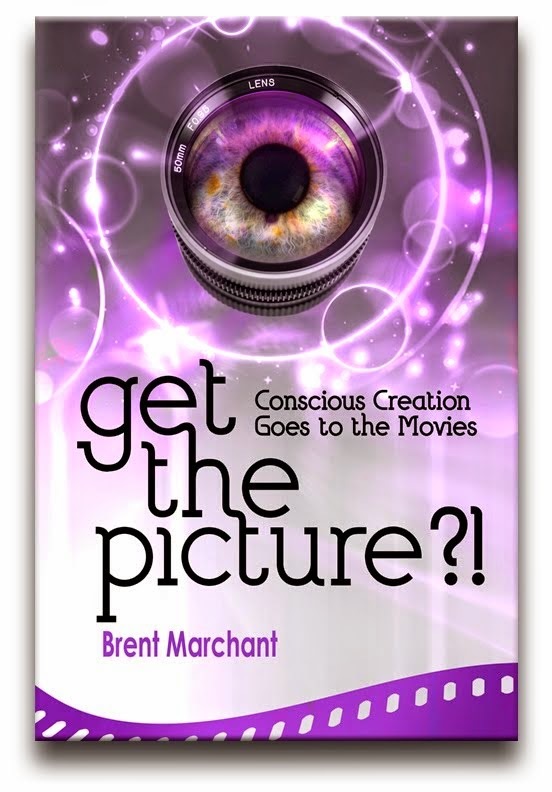 The aforementioned concepts of facing fears and overcoming limitations, for example, figure prominently in conscious creation practices, as well as in the film’s narrative. The characters’ actions in these regards provide viewers with an effective showcase for these principles at work. 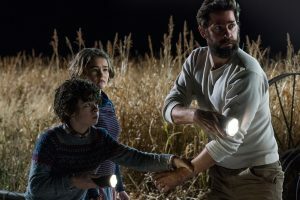 Devoted father Lee Abbott (John Krasinski, right) doggedly protects his children, Marcus (Noah Jupe, left) and Regan (Millicent Simmonds, center), against deadly predators in the new sci-fi offering, “A Quiet Place.” Photo courtesy of Paramount Pictures. Of course, if conscious creation maintains that we create the existence we experience, one might wonder why the Abbotts have manifested the reality in which they find themselves. Why would anyone intentionally want to materialize such dire circumstances? That’s a legitimate question, to be sure. And the exact reasons rest with the characters themselves, something with which viewers are not privy. However, in situations like this, we usually manifest such conditions as a means to learn and experience certain life lessons, no matter how pleasant or difficult they may be, because the only way to do so is to immerse ourselves in them to gain firsthand knowledge. We may disagree with the way in which the Abbotts have chosen to pursue such matters, but, then, it’s not up to us to judge them (or anyone else who elects to manifest any kind of comparably difficult circumstances for that matter). Since conscious creation fundamentally makes all options possible, for better or worse, at any given moment in time, the choice for experiencing certain kinds of lessons lies with each of us, and, because of that, those choices, in all fairness, should be free from such undue judgment and scrutiny. Like all of us, the characters here should be allowed to learn these lessons and experience these circumstances for themselves, no matter what we may think. We wouldn’t want others to subject us to such intense examination, and we should be willing to grant the same to them. 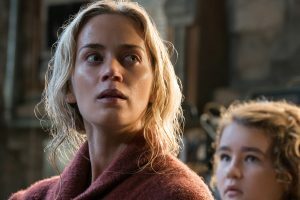 Doting mother Evelyn Abbott (Emily Blunt, left) struggles to protect her daughter, Regan (Millicent Simmonds, right), against constant perils in “A Quiet Place.” Photo courtesy of Paramount Pictures. Writer-actor-director John Krasinski’s atmospheric offering serves up a haunting, suspenseful tale that proves it’s possible to make a chilling horror film without worrying about how high the body count gets. 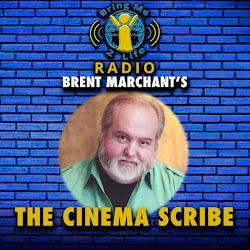 Despite a few minor plot holes, the story is solid, inventive and skillfully executed, making stunning use of elements – like sound and sound editing – that rarely get a chance to play center stage in a film’s finished product. But be cautioned that, if you go see this one, you should also be prepared to have the crap scared out of you. Those familiar with my viewing habits are well aware that I rarely screen horror films. As I have written on previous occasions, their gore-dripping gimmickry and gratuitous imagery frequently make me wish that I would have skipped the concession stand on my way into the theater. However, when pictures in this genre are intelligently handled and have something meaningful to say, I’m more than happy to sing their praises, and that’s certainly the case here. Take the time to see this one, and, if you like it, be sure to shout about it from the rooftops.